Hello all! I’ve had a few days off this week and decided that I would finally attempt to organize my home beer cellar… it’s crept out of the fridge and is moving all over the garage. Not good. Here are some of the apps, software, gadgets, tips, and tricks to cellaring your beer properly. Hope you can put them to good use! This cellar is dreamy (KP’s Cellar in Atlanta – click on the photo for more info). 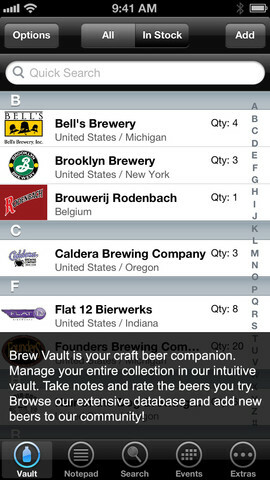 Brew Vault App, available at iTunes. At only $0.99, Brew Vault has a lot to offer the home cellarer – just check out the photos above for screen shot examples. “Brew Vault is the ultimate Craft Beer Lover’s companion. 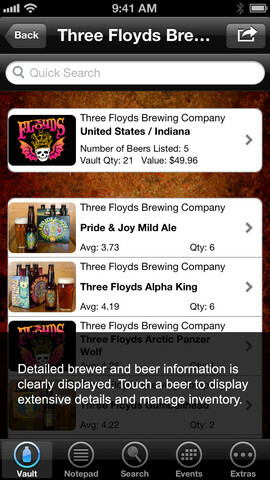 Our critically acclaimed app allows you to manage your beer cellar with a complete inventory management system. Brew Vault allows you to track each of your purchases with exacting detail…including multiple storage locations. Brew Vault also allows you to enter tasting notes, journal your experiences and create tasting events around your special occasions. This software is available online, here, for FREE. (I just downloaded it!) 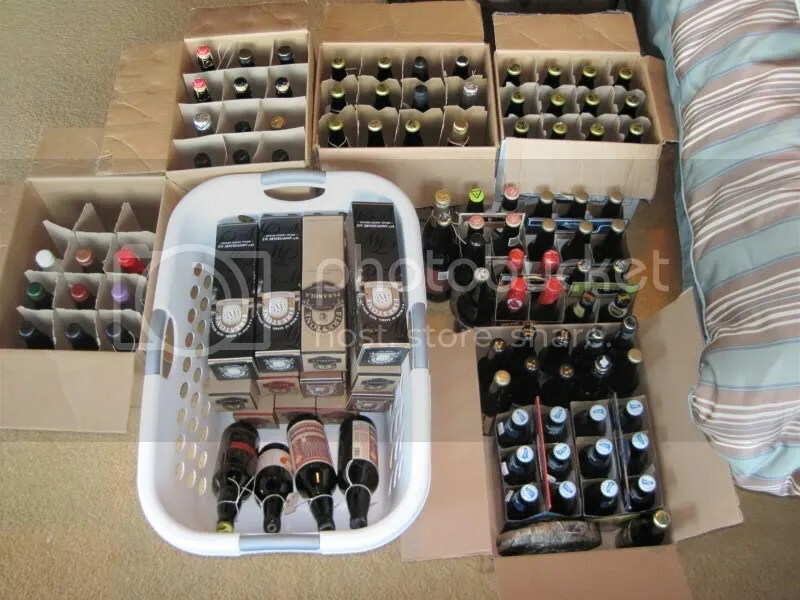 CellarHQ is a website dedicated to helping beer enthusiasts track and share their beer cellar. Designed with sharing in mind, CellarHQ lets users track the beer sizes, quantities, bottle dates, and more all backed by a database of brewery and beer information with almost 15,000 entries. Deep Twitter integration lets users share their full cellar details or immediately tweet when they add a beer to their cellar. The ‘Featured Cellar’ on the CellarHQ home page showcases users’ impressive cellars front and center for all visitors to see. I began collecting, err, “cellaring” beers this past year. Like most people who take on this endeavor, I was soon looking for a place to store my beer. Living in Southern California, keeping these beers in a closet year round was out of the question. We don’t have basements. And frankly, I don’t have the space to commit an entire room to temperature controlled storage. About the time that I decided a temperature controlled chest freezer would work the best, my parents surprised me with one for my birthday! The following is directions on how I converted this chest freezer to maximize space, and best accommodate my beers. 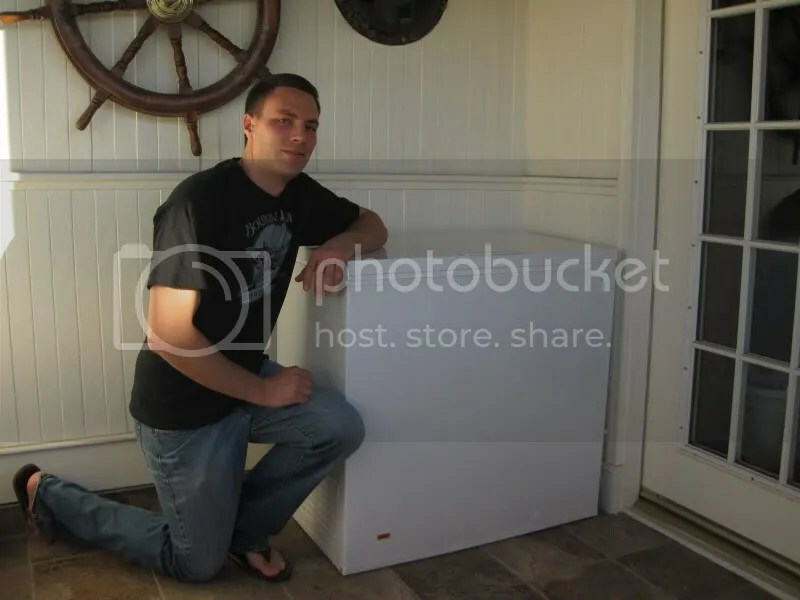 First of all, here I am with the chest freezer I am working with. For size comparison, I am just over 6’, 180. Like I said, space is an issue, so I have this out on a covered patio. It is a 7.2cu.ft. Frigidaire model #FFC0723DW. This particular one was brand new, but you can find great deals on similar units on Craigslist or at yard sales. 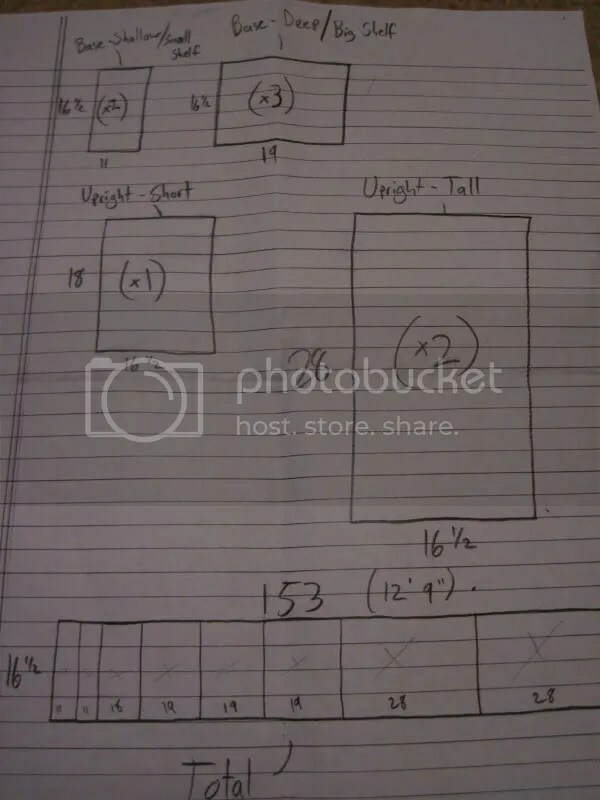 This is a perfect size unit to create a smaller-medium sized unit. I will talk more about bottle capacity later, but if you are looking to store around 100 bottles, this is a good size to start with. Bare bones minimum, these are the two things you need to begin storing beer (duh). 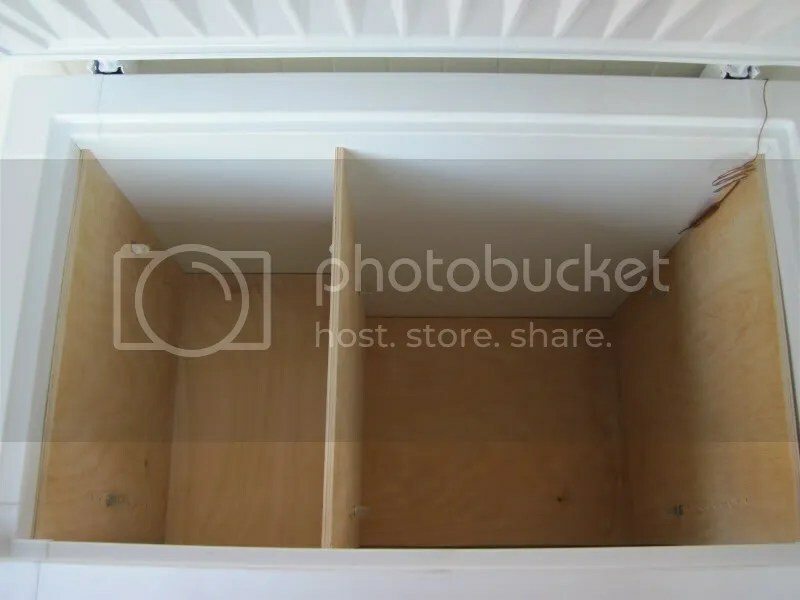 However I, and you will, want to maximize space in this thing to fit as many beers as possible. To do this, it is necessary to build internal shelving that is strong enough to hold the weight of the bottles safely, yet not so bulky as to reduce maximum storage. I came up with a plan to create a shell of the internal dimensions that will accept adjustable shelving so that as the size of my bottles change, so too can my shelving arrangement (this will make more sense as we get to pics). After talking with my dad, who has become a local handyman since retiring from LAFD, we agreed that while Starboard is an ideal material, it may be smarter to start with something a little more affordable. Starboard is a marine quality material that is super strong, but you definitely pay for it. Our solution was Norwegian Plywood. This is a very strong plywood used in cabinet making and, best of all, it can be sanded. 3/8” is ideal for this application as it is relatively thin, but still very strong. 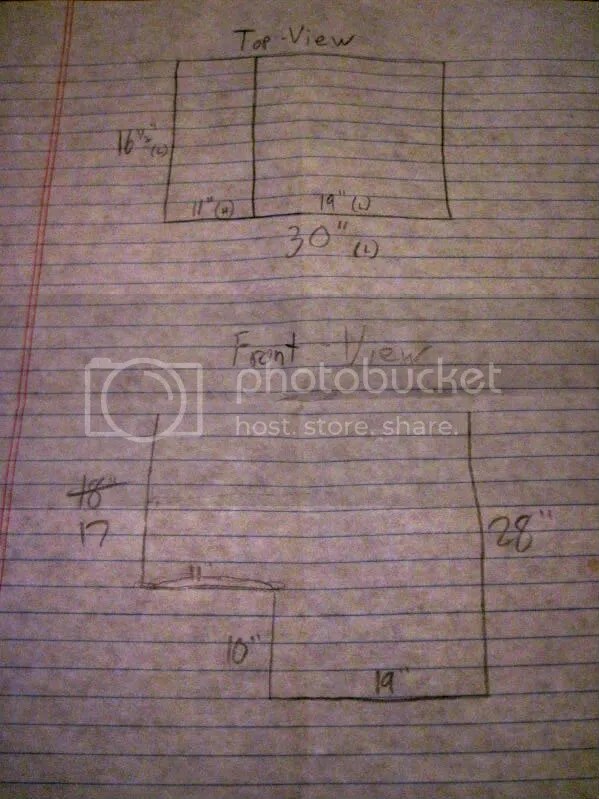 First, I took measurements of all internal dimensions, and drew them out for future reference. I wanted to create a shell that is exactly as the “Front-View” is laid out, with a shelf on either side. I figured out all pieces that I would need, and then drew these out on a “blueprint”. After all pieces were cut and shelving holes were tapped, I screwed the bases to their matching upright pieces using multiple wood screws. Essentially, the large/non-compressor side is a big U-shape, and the small/compressor side is an L-shape. Again, the snugness is very important as it will add to the overall strength of your shelving. 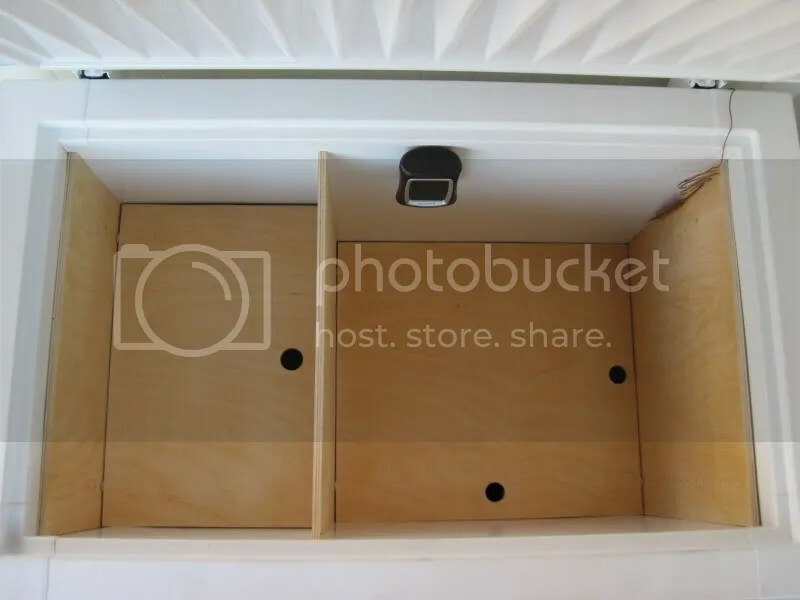 Here are pictures of the “shell” and shelving holes once everything is in place. You can see the shelving pegs that I used in multiple pictures. For reference, the left side is the compressor side. The moisture spots in the wood is from outdoor storage of this wood prior to my using it. Here is where I have begun putting beer back into the newly outfitted unit. As you can see, on the large side I can fit 31/32 large format bottles (22oz-750ml). The Firestone Walker boxes take up a lot more room than you would expect; same with the 750ml. On the smaller side, I can fit 28ish small format bottles (375ml or less).In this next picture, I have inserted a layer of shelving. I cut finger holes so that they can easily be put in and taken out. And finally, topping it off with beer. The camo thingy is a portable dehumidifier. I am using 1 Eva-Dry E-500 portable/rechargeable dehumidifier ($19.99, free shipping on eBay). Without this unit, I am reading around 70% humidity. With this unit, I am reading around 46-56% humidity. I am very happy with this range since everything I have read says that the sweet spot is to match your temperature. The only time I ever get visible moisture is when I have the top open for extended periods of time. Even then, it is never to a point that worries me. Living in SoCal, we get the occasional Santa Ana Winds. This is a very dry wind that blows from the deserts out to the ocean. We had a period of this a few weeks back, and I did have a humidity reading of 40% at that time. As you can see in the final pictures, I have a couple of other gadgets. 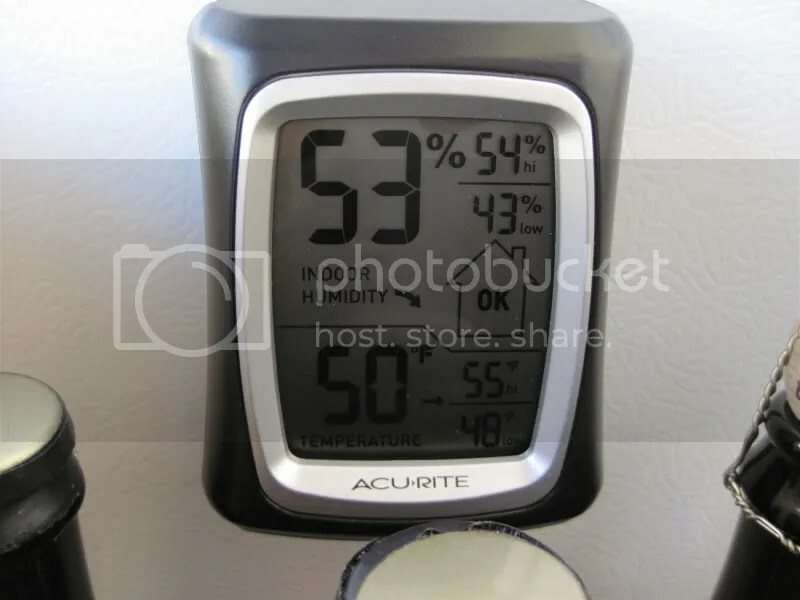 The little black box is a dual temperature and humidity gauge.It is an Acu-Rite 00325 Home Comfort monitor ($12.19, free shipping on eBay). This is a dual temperature and humidity gauge that reads current levels, and 24-hour highs and lows. Super small and has a magnetic back so it can be placed almost anywhere. The most important factor in aging your beer, also called “cellaring”, is the environment in which it will be aged. 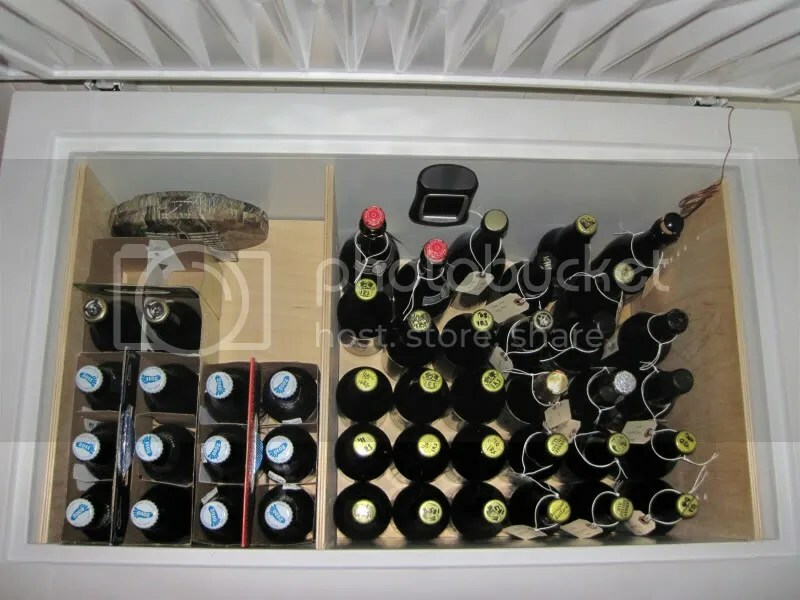 Throwing it in the garage or attic might be slightly more convenient in terms of space, but that kind of unstable environment is no good for storing beer. The optimum environment for beer is a cool and dark area with minimal temperature fluctuations. Light and high temperatures will do terrible things to beer over time. The optimum temperature range for most beer aging is 50-55 degrees Fahrenheit (10-13 degrees Celsius). You want the bottles to remain relatively dry but have enough moisture in the air to prevent corked beers from drying out. 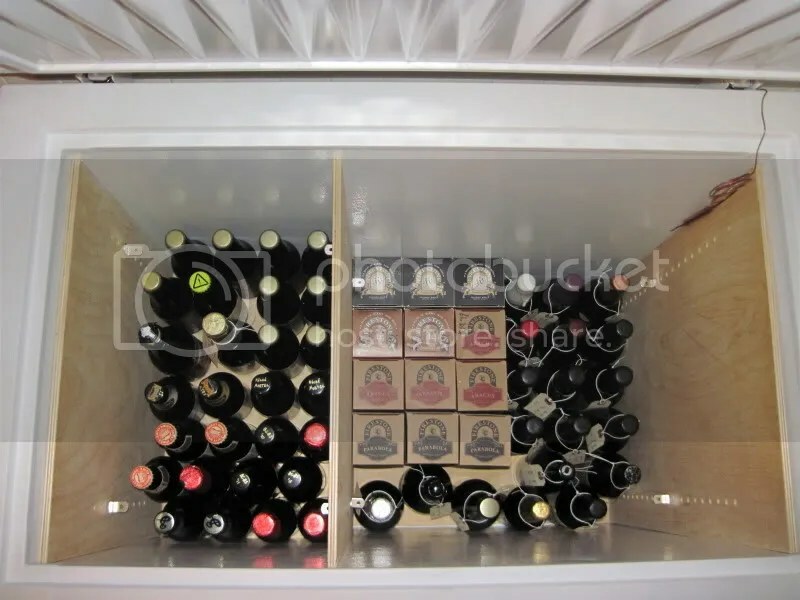 You also want to store your beer upright as opposed to horizontally like wine, even with corked beer. More information on why you store beer upright can be found here. Unless you have a cave system underneath your house, this environment isn’t necessarily readily available in most homes and apartments. Fortunately, there are other options available. 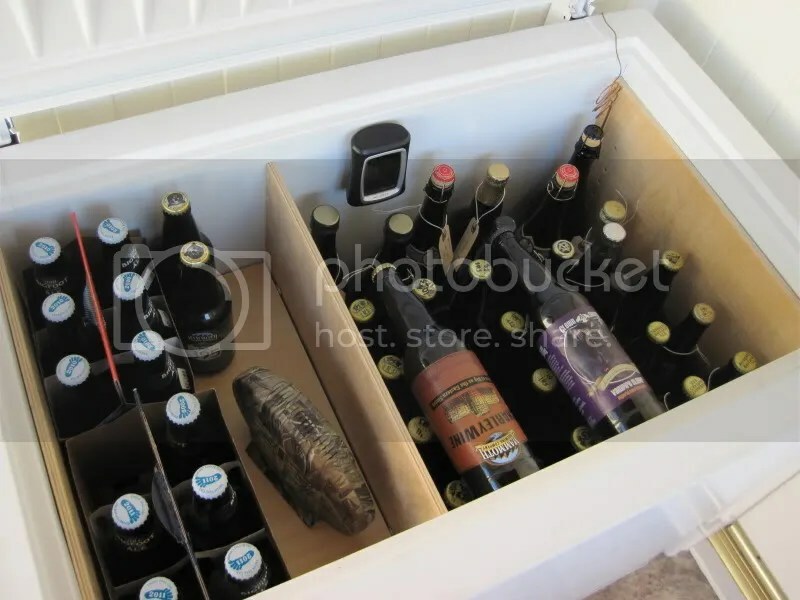 A wine chiller with the racks taken out can make a great spot to age beer. An extra refrigerator with a thermostat may also suffice, but keep in mind that refrigerators are very dry and may cause corked beers to dry out over time. If you have a basement, underneath your stairs or in a in a dark corner may be adequate places to age your beers. 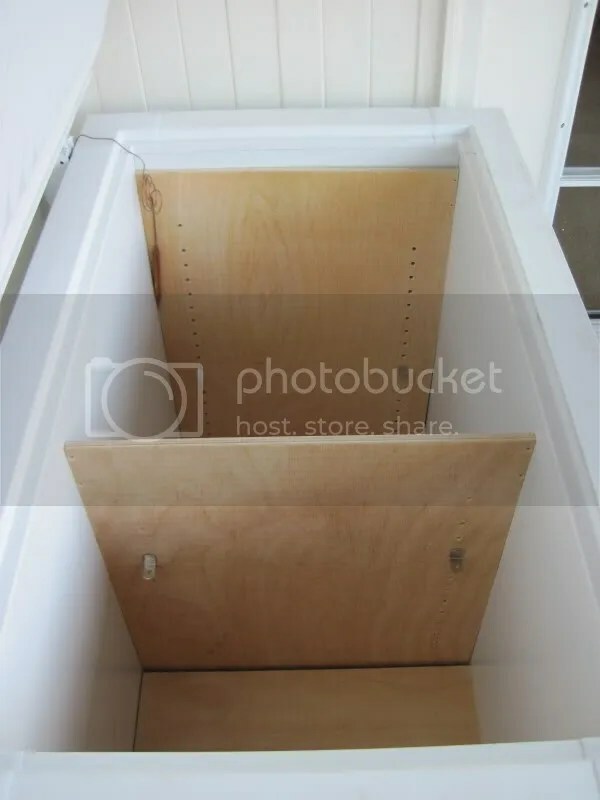 If you don’t have a basement, a small closet may be a suitable option. However, the general consensus is that if you are not in optimum cellaring conditions, you should only age beers for 2-3 years max. Organization may not be a big concern when you first start aging beers, but after having a large random collection of unidentifiable bottles laying around you’ll learn the importance of organization. How to you go about organizing beer? That is entirely up to you. You may want to organize by brewery, style, age, or other ways. Make sure your beers are easily-identifiable. No matter which way you organize, you want to be able to easily identify what the beer is, who makes it, and how old it is. If you have the space and can afford it, shelving units are some of the best and easiest ways to organize your beer. Just set up a few shelves, and stack the beers with the labels face-out. You may also want to put dates on the beers that don’t have the “Bottled On” date printed on the label. I personally write the dates on strips of paper, then stick them on the neck of the bottles with clear Scotch tape. Dating bottles is important because it’s easy to lose track of the age of beers as your collection grows. Alcohol is one heck of a preservative. High alcohol beers are usually prime candidates for aging because they will remain preserved while the flavors mature over time. Generally speaking, beers over 8-9% Alcohol By Volume (ABV) can be aged for up to a few years. Beers that are much higher, closer to 15% and up, can be aged for many, many years. Not all high ABV beers are good candidates for cellaring, but this is generally a good starting point. Sometimes, brewers will leave a small amount of yeast when they bottle their brews, which carbonate the beers naturally. These beers are known as “Bottle Conditioned” or “Bottle Refermented” beers. You can tell if a beer is bottle conditioned by holding it up to light and seeing the little slurry of yeast at the bottom of the bottle. Don’t be alarmed if you see this, yeast are perfectly fine to drink – though, you may want to leave the last ounce or so in the bottle as you pour so you do not affect the flavor of your beer. Bottle conditioned beers have live yeast in them, which would love nothing more than you hang out and create subtle flavor changes to your beer over time. Not all bottle conditioned beers can be aged, but it is something to look for on your beer aging quest. Lambics, and some other sour beers, contain a cocktail of natural yeasts and bacteria. Lambics go through what is called open fermentation or spontaneous fermentation, meaning only natural yeasts and bacteria from the surrounding area are used to ferment the beer. Lambics are considered one of the best beers to age, and many Lambic enthusiasts may argue that they will only get better with time. Generally low in alcohol, these sour beers rely on the living organisms that are contained in the bottle to keep them preserved. Their aging potential is extraordinary – I have read about lambics being aged for over 40 years and still tasting amazing! Other sour beers, such as American Wild Ales, contain many of the same bacteria and natural yeast as Lambics, and will continue to mature as the years go by. Previous Post Happy “I Love Beer” Day! Next Post What is more “craft beer” than a beard?! Vote for the best.